The most compelling, important, and revealing piece of Marilyn Monroe autographed memorabilia extant has come to auction. 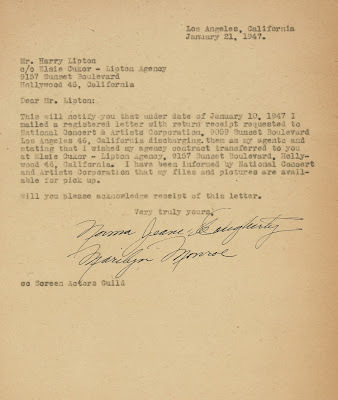 It is the earliest signed item, a business letter, yet to surface that documents the existential moment when print model Norma Jeane Dougherty became Marilyn Monroe but was three years away from becoming the star with all that followed; Norma Jeane but no longer Norma Jeane, Marilyn but not yet Marilyn. It captures an identity in flux that never found certainty afterward. Co-signed as Norma Jeane Dougherty and Marilyn Monroe and dated January 21, 1947, it will be auctioned at Nate D. Sanders Auctions on November 18, 2010. National Concert & Artists Corporation (NCAC) grew out of NBC Artist Services Department, the National Broadcasting Company's personal management branch that was split off as an independent entity in the early 1940s due to gross conflict of interest issues, NBC being both seller and buyer of talent services. It is known that Norma Jeane Dougherty was represented for modeling work by The Blue Book Agency. 1946 was a very good year for Norma Jeane's modeling career; she appeared on dozens of magazine covers, an anonymous beauty. In July, 1946, she caught the eye of and was interviewed by 20th Century Fox executive, Ben Lyon, shot her first screen test, and signed with the studio, NCAC, apparently, representing her. Norma Jeane Dougherty, at Ben Lyon's behest and with his input, changed her name to Marilyn Monroe. A year later, in August 1947, after a few tiny and lackluster film assignments, 20th Century Fox declined to renew her contract. But before that occurred, in January of 1947, she switched representation, signing with the respected boutique talent shop, The Elsie Cukor Agency; Elsie Cukor was director George Cukor's sister. That relationship would end shortly after her Fox contract expired. 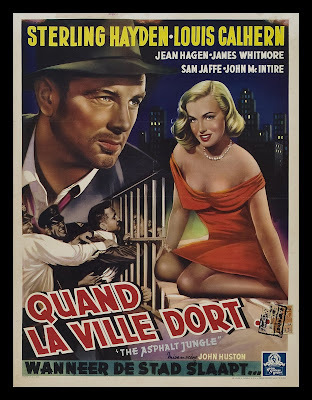 Monroe would drift for a while before hooking up with agent Johnny Hyde, who landed her a part in the Marx Brothers' Love Happy (1949), an appearance that caught director John Huston's attention. 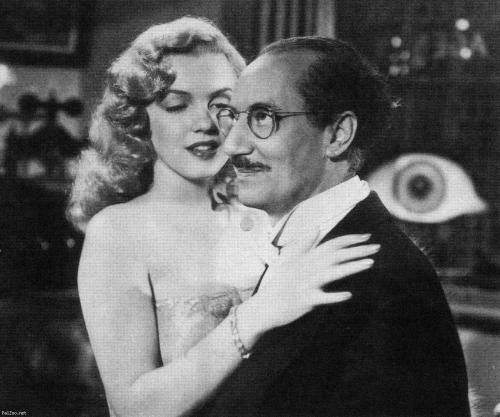 With Groucho Marx, in Love Happy. Her subsequent appearance in Huston's The Asphalt Jungle (1950) was her break-out role, and Marilyn Monroe left Norma Jeane Dougherty behind, once and for all, in fact if not in soul. 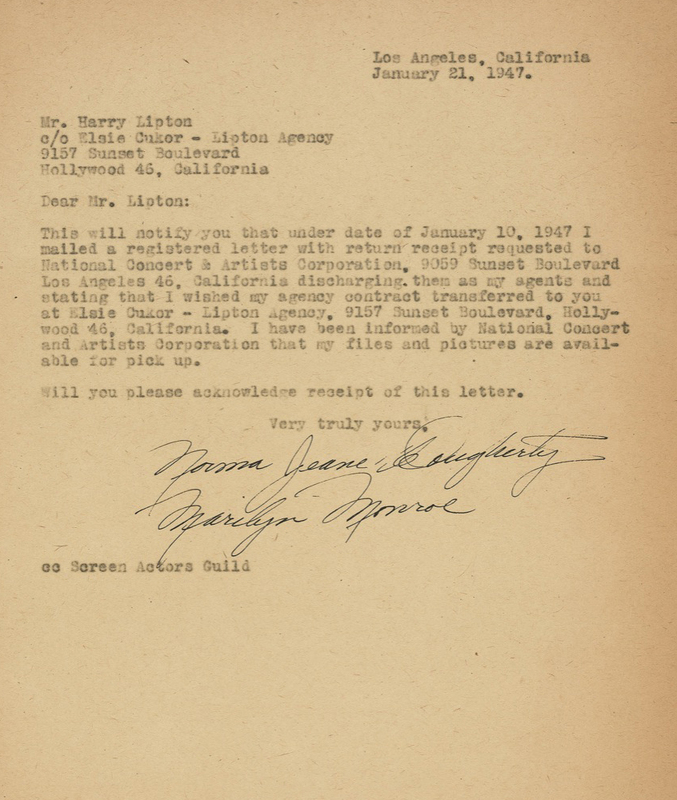 This TLs (Typed Letter, signed) records an early, key point in the tale, and it is the only known document to possess her autographs under both names, likely the first and last time that Norma Jeane Dougherty would share billing with Marilyn Monroe and vice-versa; no earlier document - none, period - possessing both signatures has yet been discovered. Single page, 8.5" x 11". In very good condition, with uniform moderate toning to the page, a bit heavier at edges, not detracting at all from the crisp and precise signatures. Image courtesy of Nate D. Sanders Auctions. This is the second time within thirty days that Nate D. Sanders has pulled a giant rabbit out of his hat. Last month, as reported by Booktryst, the auctioneer offered an unpublished Dr. Seuss manuscript that ultimately sold for $40,800 w/buyer's premium. Of related interest: Marilyn Monroe: Avid Reader, Writer & Book Collector.